In one of those classic "Huh? Really" moments, I saw someone mention that the new Zunes don't have an EQ. I honestly hadn't checked for it, because in my limited listening tests, everything sounded quite good. I didn't throw anything really hard (like vocal a capella music) at the Zunes, so I never realized the EQ feature was removed. Why did they get rid of it? I'm not sure - I read a comment that said it was for battery reasons. I assume that's because applying a custom EQ means running a real-time filter on the audio output, and that must chew up power. But here's the interesting part: the Zune 30, when upgraded to the latest 2.2 firmware, still has the EQ function, as my photo above shows (that's a Zune 30 on the left and a Zune 8 on the right). 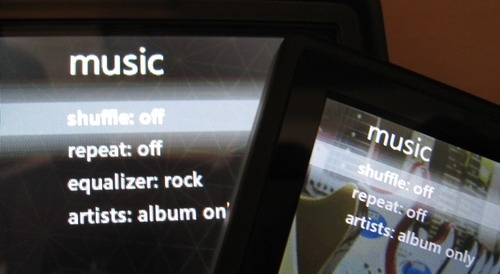 In a classic marketing blunder, the Zune team is forcing people to device what they want: an EQ? Get a Zune 30. MPEG4 playback on the device? Zune 80 or Zune 4/8. You should never force your customers to chose between your products when they want what more than one offers (beside the obvious choices like an 80 GB vs. 8 GB player).